The site of a historic waterman’s community that has never had a thorough archeological excavation. 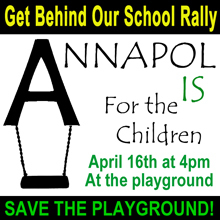 The downtown playground that is used and loved by the wider community and serves as the only playground for the historic Annapolis Elementary School. This is a playground that the city promised in 1987 to forever preserve. The City of Annapolis has put the wrong foot forward on this proposal. Rather than conduct a parking-needs study, determine if more parking is needed, review possible locations, and then solicit bids from possible developers, the city is rushing into a half-baked plan because of an artificial timeline. The city is seeking to sign a Memorandum of Understanding with the County Board of Education at the April 18th BOE meeting. The April 16th rally will include speakers, community leaders, the outline of the proposed garage, and a kickball game on the plot of land that the city wants to pave. For more information on how you can help preserve this community resource, call 410.991.6566.